People and things that I have never really known much of. Seeing Rob Epstein and Daniel Friedman’s film was pretty inspiring to me because it represents a whole world of literature that I haven’t got my hands on yet. In no way do I consider myself a reader by any means. I mean, I try to read as much as possible, but it for some reason doesn’t come easy to me. years later. My things have changed. Between the beautiful fifties dress and the exciting content of Ginsberg’s poetry, it was a feast for both ears and the eyes. 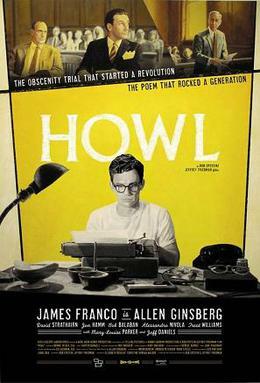 Not to mention James Franco’s fantastic portrayal of the late Ginsberg. I just recently watched the film on the late Harvey Pekar called American Splendor earlier this week. It serves as a perfect mate for Howl, not for its content, but rather how material is presented in film. American Splendor left a fantastic taste in my mouth for a rather miserable person. Whereas Howl gave me some inspiration for fostering a sense of inconventional creativity. I can’t decide if I think Maneri’s tune is fantastic or just OK. It’s a little too offbeat for my likings, I rather prefer Dizzie Gillespie’s “Stardust.” A song that proves itself to be timeless – it was released eighty one years ago! Is jazz ageless? Or am I just not well-versed enough in the genre? Probably the latter. The film’s version not done by Bessie Smith, but Jay McShann. Smith’s version is fantastic, 1923! I selected the old tunes off of this soundtrack. It’s really mind boggling to see how little I actually know about music. ’nuff said, it’s time to go do something inspiring on little sleep. Or at very least feel inspired today. This entry was posted in film, soundtrack by for the trees. Bookmark the permalink.